I've been quiet for a while, mostly because I've been working on a new USB-C board. Actually, the board didn't take the most time; that would be the firmware development. (Never underestimate firmware). The result is a cool piece of gear, a powerful development platform, and a stronger firmware library. The USB-C Explorer is a development board with everything needed to start working with USB Type-C. It contains a USB-C port controller and Power Delivery PHY chip, a microcontroller, and several options for user interaction. Here are the hardware features. Onboard regulator, input up to 20 V.
The default firmware also includes a USB bootloader. If you hold the User Button during reset, it will show up as a USB Mass Storage Device with a single file "FLASH.BIN". Copy the file to inspect the application firmware. Delete it and replace it with a new .bin file to rewrite the firmware. No programming cable is required. To use the Single Wire Debug (SWD) function for live debugging, you will need a Tag-Connect TC2050-IDC-NL "plug of nails" cable and clip. You can then use an adapter to something like a Segger or J-Link. The firmware library has also been redesigned from the ground up to support new platforms. The first of these is support for the Arduino M0. You can find that example here. The intention is that only four files, tcpm_driver.c/h and usb_pd_driver.c/h, need to be modified to support new microcontrollers. New pairs of files such as FUSB302.c/h can be added to support new Type-C Port Managers (TCPM chips). You can purchase a board from my Tindie store. This design is open source under an MIT license. All hardware designs, documentation, and firmware are freely available. You can find all design files at this github repository. I welcome feedback, so please let me know what you think. In particular, help with firmware would be appreciated. Check out Part 1 for an overview of all the USB3.1 specs, and Part 2 for more details on the USB-C connector. USB Power Delivery is a new specification that enables new functionality for the USB-C connector. In this part, I'll go over the benefits of the specification and details of its implementation. USB Power Delivery Rev 3.0 is included in the USB 3.1 specification, which you can download from here. The spec has three major purposes. Allow the use of Alternate Modes. Under the USB-C specifiction, without Power Delivery, the maximum power allowed is 15 W. Additionally, the only allowable voltage for Vbus is 5 V. With power delivery, the maximum allowed power increases to 100 W with a maximum voltage of 20 V. A Power Delivery Explicit Contract overrides any other means of determining power levels, as shown in the USB-C spec. In addition to fixed voltage supplies, there a few other options (section 7.1.3). Variable supplies are "very poorly regulated Sources". Battery supplies expose a direct connection to a device's battery. Programmable supplies expose a well regulated, but adjustable voltage output. Regardless of its other capabilities, any Source must provide a fixed 5V supply. Vendor Defined Messages (VDMs) allow devices to exchange information not defined by the USB specifications. There are structured and unstructured VDMs. Unstructured VDMs provide 14 bits in the header to use for your own purpose, along with up to an additional six objects, each 32 bits long. Structured VDMs are used to send information about, and agree on, Alternate Modes. For example, under DisplayPort over USB-C, Hot Plug Detect (HPD) is sent as a structured VDM. Alternate modes let you use some of the pins in the USB-C connector for your own purposes. The most common alternate mode is DisplayPort over USB-C. A spec for HDMI over USB-C has also been released. Modes are distinguished with the Standard or Vendor ID (SVID), a unique 16-bit number assigned by the USB-IF (section 6.4.4 of USB-PD spec). For a full featured cable, you can reconfigure the four SuperSpeed pairs and the Side-Band Use (SBU) pair. If the device has a "captive cable" (cannot be unplugged) or has a "direct connect application" (plug orientation is otherwise assured), three more pins are available. These are the two pins opposite the USB2.0 D+/D- lines and Vconn. You can learn about the connector requirements in section 5.1 of the USB-C spec. As of Rev 3.0 of the USB Power Delivery specification, only Biphase Mark Coding (BMC) over USB-C is supported. The physical layer is defined in section 5 of the spec. BMC uses a single wire to communicate between two devices, up to two cable plugs, and up to two debug devices. All communication is half duplex with collision avoidance and 4b5b encoding for DC-balance. The data rate is about 300 kbaud. CRC32 is used to ensure data integrity. BMC is a version of Manchester coding. There is a transition at the start of every unit interval, and a second transition to indicate a 1. A preamble is used to train the receiver on the exact bit rate. This is followed by a sequence of K-codes that form a Start of Packet (SOP*), which is essentially an address. Then the data is sent, along with a CRC, then finally an End of Packet (EOP). The SOP* can be one of a few options. SOP addresses the other device, and only Power Delivery Capable Sources or Sinks can respond. SOP' (aka SOP Prime) is used to communicate with the cable plug, such as in the case of an electronically marked cable. SOP'' (double prime) is the other cable plug. SOP'_Debug and SOP''_Debug are undefined, but I'm assuming they will be used for debugging purposes based on the name. For symbol and bit ordering, everything is least significant first. For an SOP* sequence, K-code 1 is sent first. For each K-code, bit 0 is sent first. When transmitting 16-bit headers or 32-bit data objects, the least significant byte is sent first, and the first bit of the 4b5b nibble transmitted is bit 0. Section 5.6.2 provides the details of the CRC-32 calculation. I've used this calculator to double check CRCs I've received. Be sure to select Hex and reorder your bytes if needed. Everything that happens with USB Power Delivery happens with messages. There are three types of messages. All messages have a 16-bit header. The structure of the header is defined in section 6.2.1. A control message is just this 16-bit header. If bit 15 is set, the message is an extended message. If bits 14..12 are not zero, it is a data message. Otherwise, it is a control message. The other bits of the header determine the current power and data roles of the sender, specification revision used, and a 3-bit rotating message id. The bottom four bits are the message type. Depending on if the message is control, data, or extended, you will need to check a different table. Most of the control messages (section 6.3) are self explanatory. The most common control message is GoodCRC. It is sent in response to every correctly received message, and has to start within 195 microseconds. Get_Source_Cap is used to request the power source capabilities of the other device. PR_Swap, DR_Swap, and VCONN_Swap are used to swap power, data, and Vconn providing roles, respectively. PS_RDY is used to indicate the power supply is ready. The data messages (section 6.4) are more complicated. Each data message has at least one 32-bit data object following the header. Capabilities messages are used to share the port's options for power. This must include a 5V fixed supply, which is always the first option, and up to five additional options. Fixed supplies are first, lower to highest voltage. Next are battery supplies by minimum voltage, then variable by minimum voltage, then programmable by maximum voltage, all lowest to highest voltage. The Request data message is used by a Sink to request a power option from the Source Capabilities list. The Sink then provides some information about how it will use the supply, including if it supports USB communications, USB Suspend, and its maximum and nominal current or power usage. Vendor Defined Messages were discussed above. BIST is used to enter Built-In Self Test mode. Battery_Status and Get_Country_Info are self-explanatory. Alert is used to indicate a change of status. Extended Messages (section 6.5) are new to Rev 3 of the spec. They are used to send a lot more information than is possible with just Control and Data messages. This can include hardware and firmware version IDs, manufacturer strings, additional battery capabilities, security information and authentication, and even firmware updates. I've been putting together some code to implement the USB Type-C and USB Power Delivery specs. As of the time of this writing, it is still early days. I started with the Google Chromebook code base and ported it to C++. After 4000 to 5000 lines of code, including a 1200 line state machine with 29 states, I have something that might be a bit messy, but is starting to work. Last week, I used this code to get 14.8 V out of my Macbook charger, using my FUSB302 breakout board. The code ran on an Arduino and used 70% of the program space. I've been pulling the Arduino-specific functionality out into separate functions. My intention is to create a more standalone library suited for embedded development on a variety of platforms. Any help and suggestions are appreciated. You can find me on Twitter, among other places. Here are some quick instructions on how to get set up with the Remote Thermocouple Monitor. This product is still in beta, so it will take some effort on the part of the user to get things working. This guide should make it relatively painless. Create a free particle.io account. Create a free SparkFun Data account. Go to https://login.particle.io/signup and follow the online instructions. Follow this guide on Particle's website. There are step by step instructions and a video explaining the process. Some notes to add. First, you can use a USB phone charger to power the Photon and thermocouple reader. Second, remember the name of this Photon, as you need to select it when you flash the firmware. Go to data.sparkfun.com and create a data stream. Make sure to add these five fields exactly: tempref_c, temp0_c, temp1_c, temp2_c, temp3_c. Click the Libraries icon in the Particle IDE. Search for ReclaimerLabs_ADS1118 under Community Libraries. Select the example and click the "Use Example" button. Copy in your public and private keys from SparkFun Data. Click the Devices icon and make sure the start is gold next to the name from Step 2. Click the Flash icon to flash this code onto the Photon. Follow the link from SparkFun Data to your stream. It should be a URL something like this: https://data.sparkfun.com/streams/AJN6lY94W1T3mNb0On8Y/. Here's what the data looks like. The example app updates every 5 minutes or so. This rate was chosen to not overwhelm the free services used in this example. Rates of over once per second are possible with different back-end services. I gave a talk at the Hardware Developers Didactic Galactic last week in San Francisco. The video will be posted eventually. In the meantime, here are the slides from the presentation. Click here. The first units of USB Power Armor Type-A are now available in the Reclaimer Labs store. I'm hand assembling these units to get them out quickly. USB Power Armor allows you to charge your devices at full speed while blocking data communication. This prevents the spread of malware, such as BadUSB. To learn more about how USB Power Armor works, check out this blog post. Highlighting the security risks of using USB to charge mobile devices, BadUSB – a class of exploits that can lead to malware infections – was recently in the news. With the adoption of USB-C, concerns are only going to increase. New devices, including the new Apple Macbook and Chromebook Pixel, only have USB-C ports, which means the only way to charge your device is through a data port that could open your computer to attack. This vulnerability is especially a concern if you want to use untrusted USB chargers, like you might find in coffee shops and airports. One way to stop these attacks is to use a device that physically disconnects the USB data lines, while leaving the power and ground lines connected. This approach has a major disadvantage because devices and chargers use the data lines to negotiate power requirements, usually via the USB Battery Charging specification. Without that negotiation, the device can’t determine what capabilities the charger has. Instead of being able to draw 7.5 W or more, the device can only safely draw 0.5 W, which means it could take 15 times longer to charge your phone with this technique. Fortunately, there is a way to block the USB data signals and still allow the device and charger to negotiate the correct amount of power. The key is that the power negotiation occurs much more slowly than the data flow: 100 Hz instead of 1 MHz. A capacitor across either of the data lines limits the bandwidth so that the charging negotiation can occur, but traditional USB data transfers are blocked. In fact, the USB specification has a maximum allowed capacitance between a data line and ground for this reason. Because the difference in speed from USB Battery Charging to even USB Low Speed is so large, there is plenty of room for error. Anything over 75 pF is outside the official USB spec for data. The data lines have a typical series resistance of 33 Ohms which means a 33 nF capacitor will create an RC filter with a time constant of approximately 1 μs. A time constant of up to 100 μs is acceptable for passing USB Battery Charging signals, and under 0.1 μs is needed for USB Low Spped, so a variety of capacitance values will work. To test my ideas, I ran an experiment. I tried three USB cable configurations and, with each configuration, measured how much power my phone drew and whether or not my desktop recognized the device. I tried the original cable as a control. Then I soldered a 22 nF capacitor between D- and GND. Finally, I cut the D- line entirely. The results are below. Capacitor installed: 7.4 W - "USB Device Unrecognized"
D- line cut - 2.4 W: "USB Device Unrecognized"
These results are in line with my expectations. The difference between having the intact cable and having the capacitor installed could result from a difference in battery load. I suspect my phone drew more current than it should have in the third test. It seemed to draw 500 mA instead of 100 mA, which is all that is allowed by the spec. Still, with the D- line connected, it drew significantly less power. I've designed a small device that incorporates these capacitors, along with some test and debug features, into a small board with a plug on one end and a receptacle on the other. It’s called USB Power Armor. I plan to build prototypes and do further testing this coming week. Here's a preview. Update: The first units of USB Power Armor Type-A are available for sale now. Click here to get yours. One of the fastest ways to get started with our seven-segment display is to use an Arduino. One Arduino can drive many digits. Up to 10 has been tested. 30 or more is practical with the standard interconnects, and hundreds are possible with multiple power drops. Connect each of the relevant lines between the on-board header and the Arduino. You'll need seven wires. To use the example code, wire up your Arduino according to the following table. Solder to the on-board pads. The pads are a bit tight in Rev 3, but they work with the Arduino Uno form factor. You'll need some 0.1 inch male header in right-angle thru-hole, such as Samtec's TSW-120-22-F-S-RA . I recommend putting the header in the Arduino, then soldering the header to the board. Once it's soldered, you can remove the Arduino and replace it at will. See the pictures below. The examples firmware projects are still being developed. Eventually, they will be turned into a firmware library for very fast integration. If you know of an existing library for seven-segment displays, especially for Arduino, please leave a comment. Each digit takes in data via shift registers. This allows daisy-chaining multiple digits together without the use of additional pins on your Arduino. Adafruit has a great introduction and tutorial for connecting shift registers to an Arduino. The Reclaimer Labs seven-segment display uses the same interface. To achieve faster speeds and drive more digits, you can use the hardware SPI controller. Although the shift register interface is different than SPI, they are similar enough to be compatible. The most important difference is to ignore the SPI chip select (CS) pin and connect latch enable (LE) to a separate pin. Once all the relevant data has been transmitted, the LE pin must be manually pulled high then low. Using the SPI hardware on your microcontroller can free up the CPU, especially if you have Direct Memory Access (DMA) controllers on-board. Most of the firmware examples include a font library. You can use this by indexing into the array and shifting out that byte. The index is the value you wish to display. font_inverted has values for upside-down digits; font is for upside-up. For example, to display a "3" on an inverted digit, you would send the byte font_inverted. To turn on the decimal point, simply set the upper-most bit of the byte. In this example, you would send the byte (font_inverted | (1<<7)). This post should be enough to get you started using the seven-segments displays with an Arduino. Feel free to leave a comment or send us an email if you have any questions. Reclaimer Labs now has a logo. I'm still working out the details of its spacing relative to the name, but it's coming together. Thanks to Two Thousand for putting this together. You can check out her other work here. I was having trouble soldering the Rev 2 boards reliably. The major problem involved the slots for the LEDs. For these prototype boards, I needed to stick to a standard PCB fabrication process, which meant that I couldn't get non-plated slots. Unfortunately, plated slots make it very easy to short out the LEDs. To test for a short, I used my multimeter on the diode setting. If the LED lit up, there was no short; if the buzzer beeped, I needed to rework the soldering. Fixing three or four LEDs per board was very time consuming, and it took me 90 minutes to solder the first two boards together. I needed a better solution to cover the plated slots. At this point, the nail polish came in. I used it as a sort of temporary solder mask. It stinks a bit when the soldering iron hits it, but it's not much worse than the solder itself. Out of the next eight boards, I experienced two shorted LEDs, and that improvement made the process much faster. I'm not convinced nail polish is the best solution, so if you have other suggestions, please leave a comment. Tonight I spent some time thinking about the pinout for the connectors. One of the major issues with Rev 1 was that the pinout was incompatible with the boards when they were touching each other. The lesson I learned from that mistake was to be very careful when using the mirror command on connector components in the schematic editor (the mirror command is usually more trouble than it's worth). I also learned that it's a good idea to have a supply of Arduinos on hand. I've since fixed and tested the new pinout on the Rev 2 boards. 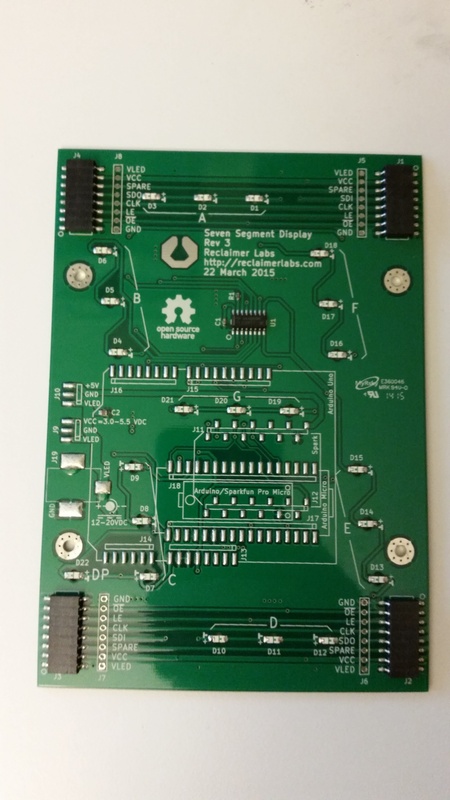 The boards interconnect perfectly and have no issues with shorting power and ground. As a precaution, I added PTCs, a resettable fuse on the VLED line. With the design ready to work for normal usage, I wanted to focus on user error. A user will connect to one of the two "IN" connectors on the board. So far, I've only used individual jumper wires. However, it's possible that a user could use something like a ribbon cable with a matching pitch. I wanted to find out what would happen if the user flipped the cable around and installed it backwards. First, I looked at the schematic. Normally, swapping power and ground would be a problem. However, in this case, swapping VLED and GND connects ground to the anodes of the LEDs. Next, I checked the "Absolute Maximum Ratings" section of the TLC5917 datasheet. The limits seemed tight, especially when applying negative voltages to the pins. This situation would arise if 12 V were applied to ground and 5 V were applied to the pins, such as CLK and SDI. The chip would think it was getting -7 V on some of its pins. After thinking about the various ways to arrange the pinout, I was unable to come up with a solution that would stay inside the maximum ratings when the connector was reversed. The last thing I needed to do was test the pinout. Swapping my individual jumper wires around, I plugged it in and expected magic smoke to come out. I was pleasantly surprised when nothing popped. The only component that was getting hot was the 22R resistor bank on the Arduino, located near the USB connector. Fortunately, the resistor bank was able to survive a few minutes of punishment. I then swapped everything around, and the system functioned normally. I'm satisfied with the current pinout. The system withstood a reversed connector long enough for the user to realize something was wrong. Hopefully, the instinct to disconnect the power when things don't go as expected will win out. Ultimately, it's expensive, if not impossible, to design for every contingency. I did test a few other pinouts and had far worse results. I hope my new Arduinos will arrive soon.